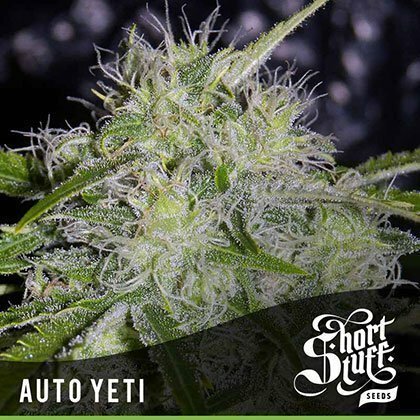 Buy ShortStuff Auto Yeti seeds from dope-seeds.com now! Auto Yeti is a very bushy cannabis strain but unlike most bushy autos she gets very tall as well. In the right conditions plants will easily reach 1m (33) in height and can also get just as wide. Each bushy plant will have numerous bud sites with dense frosty Nuggs which will become covered in THC crystals during flowering. Auto Yeti is part of our Boutique Line of cutting edge Autoflowering cannabis genetics. The Boutique Line contains the most up to date autoflowering genetics which are pushing the boundaries of what can be done with autos. All the strains in the Boutique line are big, tall, heavy -yielders and have been produced in-house by Shortstuffs master breeders.